Who the ? Where the ? Why the ? 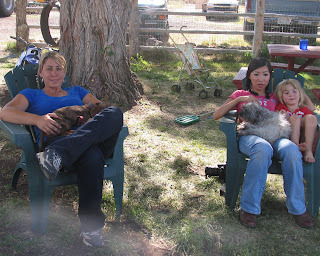 My Sweet Husband and I relished the thought of being at our ranch for a few days ! We left Redding and after about two and half hours we started up Cedar Pass. On top, we encountered snow ! What a wonderful sight. Dropping down into Surprise Valley, the snow disappeared. Well, there were patches here and there. marveling at the quiet and peaceful view. 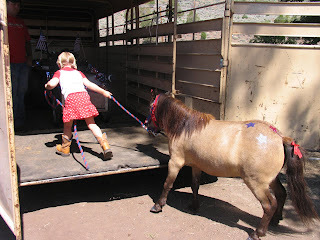 And then we decided to take a walk out in the corral. I suggested it might be time for another cup of calming tea ! May all your cares be soothed with a cuppa ! Thank God It Was A Recording…. 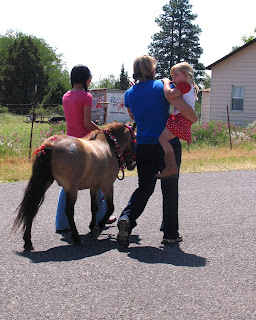 After the dump run and a few more clean up chores at the ranch, I decided to hook up my Wild Blue internet and connect with the more populous parts of the world ! Wild Blue is especially helpful to us who live in the most remote areas on God’s Great Earth ! (Birds really like Wild Blue too). We always unplug the internet when we leave. We know from experience that an unexpected storm and power outage might occur and wreck havoc with all kinds of systems ! This has been firmly established in our minds after we lost 2 freezers full of beef !! I plugged in the internet device. However, my computer kept saying ” perhaps you are out of range”. Well, that made me hoppin’ mad ! It isn’t cheap to have high speed internet service in the boondocks and I sure expected it to work ! I called the tech support number, which of course, re-routed me to another number and then it wasn’t even a “living” human being, but a recording asking me to go through a few simple steps. While listening, and remembering not to respond to the recording, I performed the required tasks. Like a robot I unplugged and plugged in the device again. And, still holding the phone to my ear, I saw there was another cord lying there. The recording continued to give directions, which I only half heard. I plugged in the second cord and low and behold, my device started showing the tell tale yellow light that says we have a wireless connection ! Thank God I had been talking to a recording and not a real person ! Obviously, I should have had a cup of tea first….but, you know, any time is a good time for tea ! And watch out for your neighbor…..
you also have to watch for rocks !! Most of the the time the half hour trip is uneventful, but there have been days and nights when we have encountered all of the above ! Happy travels and don’t forget to have your tea when you get there ! The book and the letter from the court came in the same week. Cowboy Ethics, a western “picture book”, written by James P. Owen, makes a case for what Wall Street could learn from the “Code of the West”. In the forward, David Stoecklein, (also the photographer), says, ” The West is a place where the fence is always tight, but the gate is always open to friends and neighbors. It is a place where a man can make tough decisions without looking over his shoulder or worrying what someone else will think. A cowboy get his strength from knowing what is right and what is wrong and being true to his beliefs”. At first, I viewed the book as entertaining, full of gorgeous photographs and good stories. People I know and love have always abided by similar tenets; it didn’t seem necessarily relevant to our personal lives. I decided this gem would be added to my ” Great Gift Ideas” list. A few days later, the letter arrived from the court stating that our “friends” were filing bankruptcy . We had loaned them a great deal of money to buy equipment to start a business. A contract had been drawn up and signed with an agreed upon repayment schedule. For the last six months we had been trying to communicate with them. All of our calls and letters were ignored. Bewildered, we wondered why they hadn’t at least called or written to us to let us know they might be considering bankruptcy. Perhaps we could have recovered some of our loss with the sale of the equipment. Suddenly the book on ethics and a code of behavior became relevant. Realistically, I understand there is no way to legislate ethical behavior. Even in countries where punishment is severe, there are those who push the line and break “the rules”. 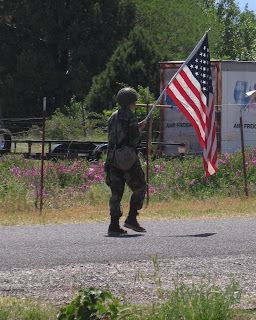 I don’t think we, us, the American people, have lost our commitment to honor principles. I do think we have to be diligent in remembering and teaching (especially by example) a code of ethics, values, what we stand for ! July 25th will be the one year anniversary of the death of Professor Randy Pausch, the author of The Last Lecture. He said in an interview with Diane Sawyer, that he wanted to leave his children memories of values, of what he stood for, not just memories of himself. The following interview is heart-rendering ! He was Dr. Randy Pausch, a computer science professor at a prestigious college in the east, but his values, his code of ethics closely resemble the “Code of the West”. May we always remember however we describe our behavior, whether it is a “Code of the West” or “values” or “what we stand for”, the choices we make concerning our “manner of conducting ourselves” do matter !! Building a fence….Do It Right ! Gabe, now nineteen, reminisced about the summer he was thirteen and stayed a week or so with us at the ranch to help build that fence. mountains. 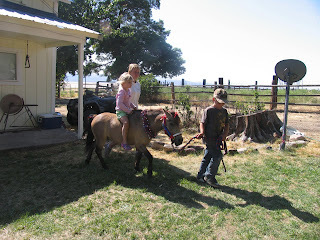 After Sherman married Phil’s mom, they always had donkeys or horses. Phil and his siblings built and rebuilt miles and miles of barb wire fences. -law to be, several nephews and young friends learned to build good strong fences capable of corralling critters and prevailing, in tact, through the years. Barb wire fences are tough to build and maintain, especially if the terrain is steep or rocky. Post hole digging is tedious. Slamming steel post into hardened ground with a fence post driver is body numbing. It’s boring and slow moving….miles and miles of posts and wire. There is no way to avoid nicks, scratches, torn shirts and frustration. Depending on the weather, you are either sweating dirt or morphing into an icicle. 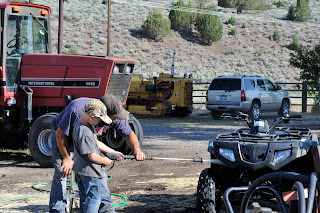 One year our rambunctious twenty year old son was in charge of the “day cowboys” ( our nephews) and fence building was the main project. On a scorching hot day, three dusty young men stomped into the house, declaring that Travis was impossible ! T.J. had just taken a measuring device and decided that the fence the boys had spent hours stretching and crimping didn’t meet his approval. He told them to rip it out and start over. They were fit to be tied ! Of course, T.J. had learned this technique from his father, and his grandfather. 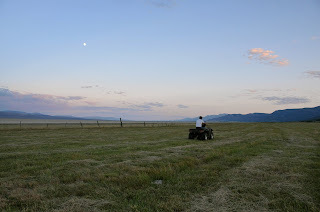 In ranching country how a man builds and maintains his fences affects his reputation. The fence has to be built just so…to last…to be straight…and taut…able to keep in his own stock and keep the neighbor’s bulls out ! Red Steagall, a cowboy poet, wrote a great poem, The Fence That Me and Shorty Built, summing up why it’s important to do a job right ! 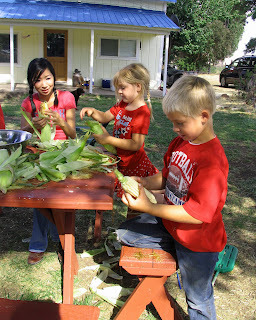 or shucking corn on the cob for dinner. After the work is finished, you can rest your weary dogs ! And drink a little iced tea ! Take the husks off and clean off the silks. Using a piece of foil larger than the ear of corn, place the corn in the middle of the foil. Rub butter all over the corn and sprinkle salt and any other seasoning you like. Wrap the foil around the corn and place it on the grill. 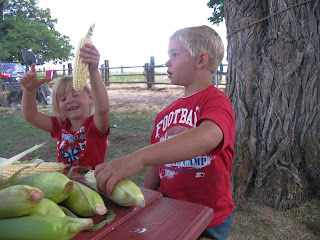 Roll the ears occasionally to make sure the corn cooks evenly. After about 10 minutes, stick a fork through the foil to test . Kernels will be soft when the corn is done. Remove from the grill and cool for a bit. Take the foil off and enjoy ! 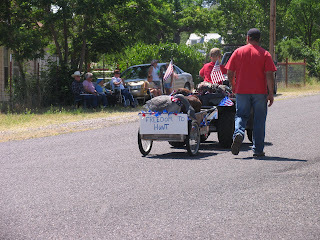 Lake City, a tiny town (229 approximate population) in Surprise Valley, hosted a grand 4th of July Parade. 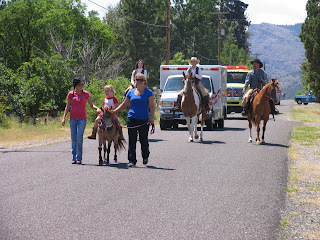 Half the town were spectators and the other half were parade participants. 1. 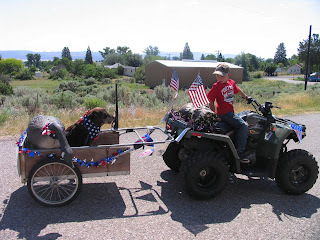 Mitch on his quad pulling a trailer loaded with a goose (plastic) and the “dog that can do no wrong”, Osa. (My son’s old hunting dog). The quad, trailer and goose have been spruced up and loaded. 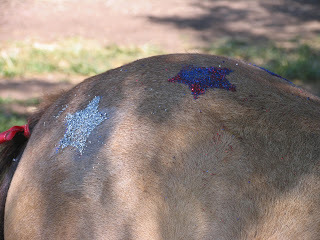 Everyone takes a turn entertaining the pony so he won’t roll and mess up those perfect stars and that perky red bow. Hey cowboy, that’s a mighty fine lookin’ horse ! Time to go. Hayley loads Spaghetti in the stock trailer. Mitch checks his passengers before entering the line-up. The Colors lead the way…. …..who are all these people ? Hayley and Spaghetti happy now to be with the other riders ! And a reminder for all of us….we have much to be thankful for….especially to live in the U.S.A.! Hope you all had a blessed 4th of July ! 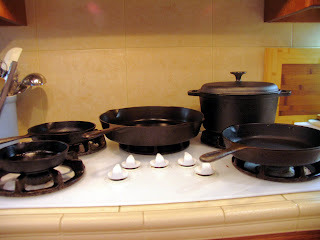 We started using cast iron while living on our ranch in Surprise Valley. It seemed to fit our life style…durable, ( can take abuse), multi-purpose ( easily goes from stove to oven), inexpensive, lasts a life time ( or two) and cooks evenly. We still use cast iron at the ranch, but after replacing 3 Teflon skillets at our Redding home, I decided to invest in more cast iron cookware. My husband is a great cook, and the iron skillet suits his style and temperament..meaning he doesn’t want to worry about the pan he’s cooking in, while he’s cooking. An added bonus is having wrist and arms weights every time we cook ! 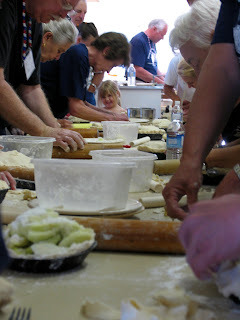 Last week, at our Rinehart Family Reunion, in Cedarville, California, our Cousin Bonnie demonstrated how to make an apple pie in a cast iron skillet. We had asked everyone to bring a six inch cast iron skillet to make a pie for two. Twenty adult “Cousins”, and several of the younger generation, participated in this class. Preparation began with peeling the apples: two young Rinehart cousins happily peeled 40 apples rather efficiently and floated them in water with a little lemon juice. 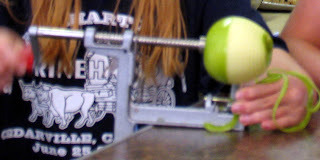 Later, the apples were cored and sliced. Pre-measured ingredients w ere stationed at two tables and dowels (our rolling pins) distributed. 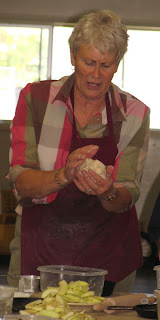 Bonnie, an excellent cook, and practiced pie maker, discussed the importance of handling the dough as little as possible. 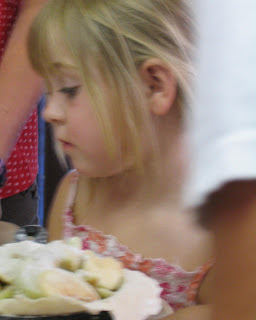 This photo shows Bonnie forming the dough into a ball. Just a little note, one time, when we were in our twenties, Bonnie got up and made three pies before daylight, so we could take them to the branding that day ! I watched with fascination…my Grandma could bake a great pie, but I’d never seen anyone do it so quickly ! I’ve been intimated about making pies for over 40 years now ! The results were stunning. The ooobh’s and aaahhh’s from delighted cousins identifying and admiring their finished handiwork filled the room. 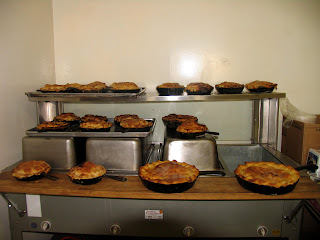 Everyone hurried through dinner so they could dig into their apple pie in a cast iron skillet ! A perfect recipe for the 4th of July weekend … Cousin Bonnie’s Cast Iron Skillet Apple Pie. Happy celebrating & may all your infusions be as sweet as apple pie ! Roll 1 ball on floured board/counter in circle for bottom crust, it must extend over edge of the skillet.